All carpets that are manufactured are a result of the conversion of raw and pure fiber. With a few exceptions, this fiber is spun into yarn and this yarn is then made into carpet through one of three methods - weaving, tufting or bonding. All carpet fibers have a specialty to offer, whether it is its warmth, its easiness to clean, hard wearing effects, fire resistance or even price. Your carpet will perform longer and look better accordingly to the fiber you select and how much is packed into the carpet. Fibers are sometimes blended together to give the optimum performance at the best possible price. There are two sources of carpet fiber - Natural and Man-Made. Wool – Is the oldest and most popular of the natural fibers. It is exceptionally suitable for carpets because it combines hard wearing effects with long lasting good looks. 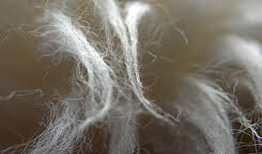 Wool does not support combustion and under normal conditions does not conduct static electricity. Silk – Little used except in fine quality hand-made rugs. Jute – Used mainly in backing materials but also occasionally in surface fibers for flat woven rugs. Coir – Coconut husks contain a strong and flexible fiber. The husks are harvested and soaked for many months before being beaten, washed and dried. The pale yellow fibers are then spun into yarn which is finally woven into either flat weave carpeting or cut pile rugs and mats. Flax – Used only occasionally in loop pile and flat weave rugs and carpets. Acrylic – Is not as hard wearing as Nylon and less fire resistant than wool, Acrylic is a fiber with good bulk and resilience. Polyester – Is used in luxury Saxony styles, less resistant to flattening than some fibers but wears well. Polypropylene – Is a hard wearing and not as resilient as other fibers. It is very easy to clean but will scar if exposed to flame. Viscose – Is not as resilient as many other fibers it is prone to flattening. But it is a relatively inexpensive fiber and it brings fitted carpets within a wider reach.